Burdock in Bloom . . .
“Elephant Ears” spoke to a detail everyone pointed out whilst on walks through the leafy city neighborhood of my boyhood. Autumn hikes and winter downhill sled rides encountered “Burrs” on the wool clothing that kept me warm. The plant continues to make its presence known as a sure neighbor. 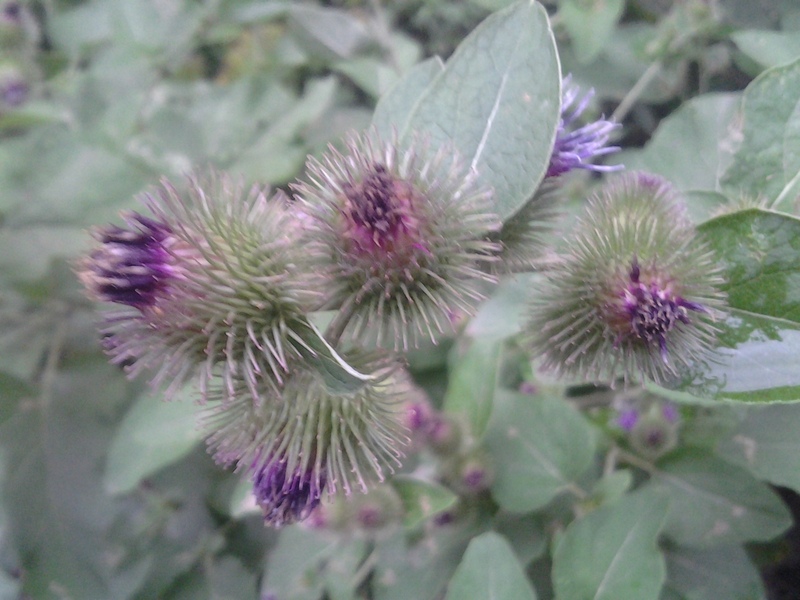 Today Lesser Burdock is in bloom throughout the region. Attractive stands of Arctium minus, of the family Asteraceae, can be found along the west in Van Cortlandt Park and in Riverside Park and in scattered patches farther south in Manhattan. The latter stands remain lush until gardening companies turn wild plant fields to brown lawn. No negativity from here shall be introduced to the curating of plants. I do continue to uphold a broader definition than recent standard, as in my lexicon I do include IMMIGRANTS rather than “invasives” or “invasive species” – terms to me that beyond technical definition ring hollow given the diverse people, the first source of all these mixed species, who have also come to populate the Western Hemisphere. 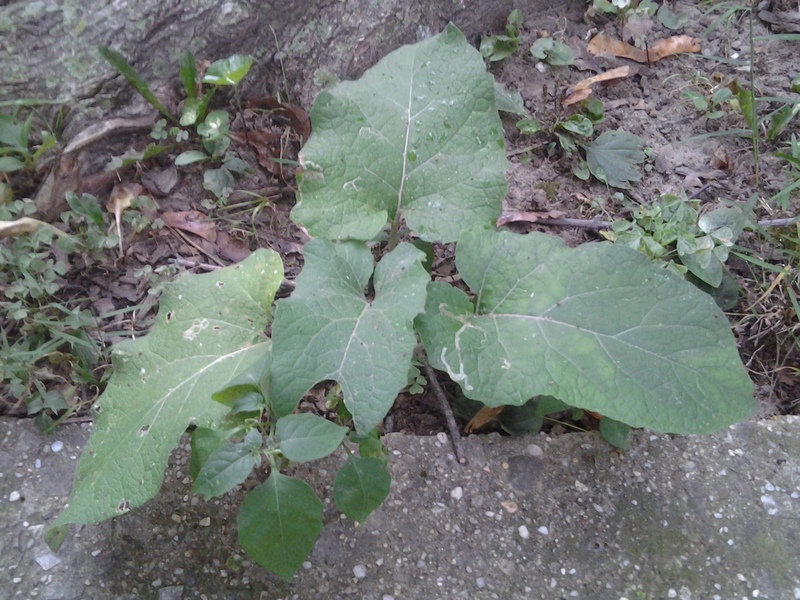 Burdock varieties hail from Continental European sources. The plant lives as a vigorous green, edible when young, with health benefits as a digestive. The innumerable hooked spines of the seed heads, burrs, inspired a Swiss inventor, George de Mestral, to do the studies that resulted in the useful tool we have named Velcro. The plant rises from a stout central stem that supports lobed ovate leaves that narrow toward the tips, all arranged in a graceful, aesthetically pleasing manner, like draping pachyderm ears. Some leaf parasites often tunnel their way within, leaving topical asymmetrical veination as summer progresses. Flowers appear tight and spiked in a purple to true pink quality akin to thistles. Once browned by the end of the season, seed heads become bunches of burrs on stalks. Animals: birds, and the most prevalent mammal of all, people, when out of doors, all help to spread the Lesser Burdock to a greater range. Greater hardiness marks this plant’s vitality as well. Ava Chin, author of Eating Wildly: Foraging for Life, Love, and the Perfect Meal, describes mingling Burdock with other early winter greens. But now high summer reigns August. This year’s is damp and cooler, averaging in the eighty degrees Fahrenheit, giving more urban green than on hot, dry years. Burdock is in abundance in this weather. 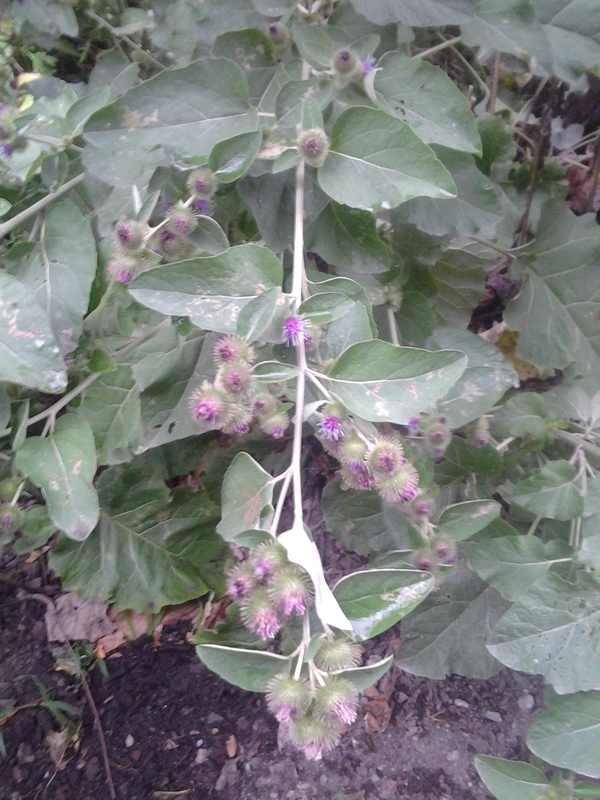 Burdock is in bloom.